Roma remain in control of the race for Italy's second automatic Champions League place after fighting back to beat Udinese at the Stadio Olimpico. On-loan Chelsea striker Stipe Perica put the away side ahead, before an unmarked Roma midfielder Radja Nainggolan headed in an equaliser. 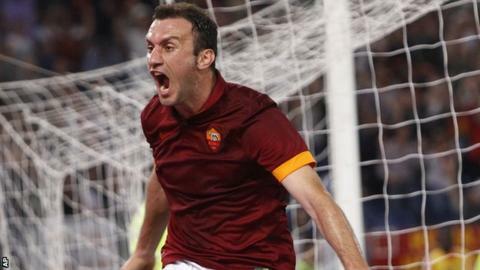 And Vasilis Torosidis's close-range finish ensured Roma remain in second place with two matches left. Rome rivals Lazio are a point behind in third, with Napoli also in contention. Rafa Benitez's men will move within three points of Lazio if they beat already-relegated Cesena on Monday. The top two in Serie A are guaranteed places in the Champions League group stage, while a third-place finish ensures a spot in the qualifying round. Match ends, Roma 2, Udinese 1. Second Half ends, Roma 2, Udinese 1. Víctor Ibarbo (Roma) wins a free kick on the right wing. Foul by Panagiotis Kone (Udinese). Vasilis Torosidis (Roma) wins a free kick in the defensive half. Foul by Iván Piris (Udinese). Offside, Udinese. Emmanuel Badu tries a through ball, but Alexandre Geijo is caught offside. Adem Ljajic (Roma) is shown the yellow card for a bad foul. Foul by Adem Ljajic (Roma). Allan (Udinese) wins a free kick in the defensive half. Substitution, Roma. Adem Ljajic replaces Miralem Pjanic. Vasilis Torosidis (Roma) is shown the yellow card. Attempt missed. Cyril Théréau (Udinese) right footed shot from outside the box is too high. Assisted by Alexandre Geijo. Iván Piris (Udinese) wins a free kick in the defensive half. Attempt blocked. José Holebas (Roma) left footed shot from the left side of the box is blocked. Assisted by Miralem Pjanic. Substitution, Roma. Seydou Doumbia replaces Juan Iturbe. Substitution, Udinese. Alexandre Geijo replaces Guilherme. Attempt saved. Radja Nainggolan (Roma) right footed shot from the right side of the six yard box is saved in the centre of the goal. Assisted by Juan Iturbe. Radja Nainggolan (Roma) is shown the yellow card for a bad foul. Attempt missed. Iván Piris (Udinese) right footed shot from outside the box is too high. Foul by Vasilis Torosidis (Roma). Juan Iturbe (Roma) wins a free kick on the left wing. Substitution, Roma. Seydou Keita replaces Francesco Totti. Substitution, Udinese. Bruno Fernandes replaces Giampiero Pinzi. Corner, Udinese. Conceded by Kostas Manolas. Corner, Udinese. Conceded by Juan Iturbe. Offside, Udinese. Danilo tries a through ball, but Emmanuel Badu is caught offside. Substitution, Udinese. Panagiotis Kone replaces Stipe Perica. Goal! Roma 2, Udinese 1. Vasilis Torosidis (Roma) left footed shot from very close range to the bottom left corner. Assisted by Francesco Totti. Attempt missed. Víctor Ibarbo (Roma) header from the left side of the six yard box is too high. Assisted by Francesco Totti with a cross following a corner. Corner, Roma. Conceded by Silvan Widmer.